I ended the last blog on Asthma and running with painting a ‘poor boy’ image of myself and asthma. This new journey into self-pity was so much fun that I decided to take it a little further, thus upsetting all categories of readers: asthmatics, runners and muggles. As I started running in my forties, I found that running was actually doing some interesting stuff with my asthma. The longer the run, and steadier the speed, the less would I need the inhaler. Apparently, I wasn’t the only asthmatic trying these stunts. In the Airtel Delhi Half Marathon (ADHM) 2015 (this is the first time the brouhaha about smog started), I was the 2:20 pacer, and, as is my wont, I would chat up some runners and pep them up. I found many runners who said they had practiced less because of the smog. And I met this lady who had flown down from Singapore and was doing her first inhaler-free run. I got pretty scared, and all of a sudden, I became my own sister and offered her both my inhalers. She politely refused. Once I broke into barefoot running, I realised that I wasn’t panting in the first kilometre. In other words, no warm up. So, was barefoot running good for asthma? Was there some acupressure working? When I shared this thought with a sports Doctor, he pooh-poohed it. “It’s just the puppy love stage between you and barefoot running.” So,I let go of such thoughts. Till the next ADHM (2016). At ADHM 2016, I was pacing 2:30 and I passed a lady running in socks! She gave me the most interesting reply ever. Since then, I have been observing my asthma over running barefoot, running in slippers, sandals, canvas shoes, cushioned shoes, and, yes office formal shoes- all to test Socks Lady’s claim. I have figured that it’s not just the barefoot part. And it’s not a total relief from asthma. 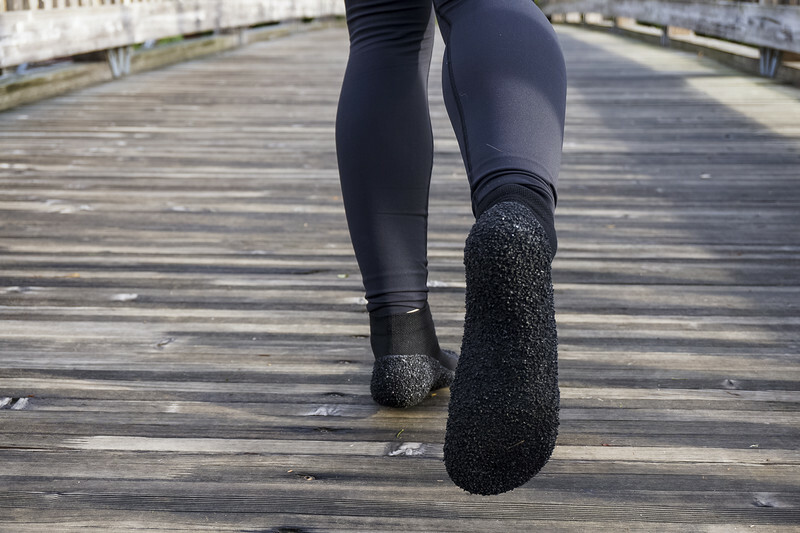 What happens is, when you are barefoot, running in only socks or your shoes have no cushioning, there is no bounciness in your body. So, the first kilometre, when run in so-called running shoes (the ones with padding), there are more jerks, so you pant more. When you are barefoot, or in socks or un-cushioned footwear, this doesn’t happen. Over the last 8-9 months, I have gone from Fit to Fat, and my asthma has gone up, it doesn’t make a difference anymore. When I’m asthmatic, I still pant in the first kilometre, barefoot or not. Every city has an ‘asthma season’. Delhi’s is normally April 13 to 1 May. The reason I can put my finger there is that wheat husk is a common allergen, and April 13 is Baisakhi, the festival of harvesting. Even in the best of my fitness, asthma season does not let you run. In fact, this year was the first time I ran regularly in April. Unfortunately, that was only because I was on oral medication, prescribed by my new-found Asthma Doctor, which we will touch upon in the next blog of this series. This is a bit of humdinger. Many Delhi-walah asthmatics, who are affected by air borne allergens, actually get better in humid climates. (As per my asthma Doctor that’s temporary). However, with all allergens washed away, you would expect an asthmatic to have a great run in the rain! Not for this asthmatic runner. Running or not, rains always bring on the wheezes. It’s like turning on the air conditioner suddenly. Once again, I find a barefoot run in the rain far less wheezy than a regular run. Of course, one has to watch out for the slippery areas. The first time the brouhaha of smog hit the headlines was the Autumn of 2015. The Delhi Government reacted by introducing Even Odd. Frankly speaking, my practice wasn’t really affected, except when I would pass by the part where they were burning leaves. That’s when I met No-Inhaler Lady. In 2016 the hullabaloo over smog was even worse. People were taking out petitions, air purifier sellers made a killing and even schools were let off for a few days. Those days I was cycling to work. Yes, 8 kilometres in peak traffic with 5 flyovers, and, frankly, not much trouble. Of course, the inhalers were on. I frankly don’t know how the science of Smog works with the science of Asthma, but this asthmatic was not wheezing in the Smog of 2016. Not only that, I refused to sign any of my (now ex) friends’ petitions. Because none of the petitions talked about what citizens would do to reduce pollution. Just Government, Government, Government. I got my just desserts, though. Right after the smog cleared, I got asthmatic. This being the peak training season for marathon runners, I was now worried about my SCMM (for muggles, SCMM is the Standard Chartered Mumbai Marathon, the holy grail of running in India). The event was in January. And we were already in December. Will I better my timing? Will I miss it and register a DNS (Did Not Start)? Will I have a DNF (Did Not Finish)? I am not a Doctor. All the above are purely my own experiences. Imitate them at your own risk. Contact me if you live to tell the tale. Sanjeev Chhabra , 53, a management consultant in the infrastructure industry, is a true maverick runner, and one of the pioneers of Delhi’s first night running club. Sanjeev is doing a Three Series Blog on Asthma and Running for WellthyFit. In next edition of this three part series, he will touch upon the oral medication, prescribed by my new-found Asthma Doctor!